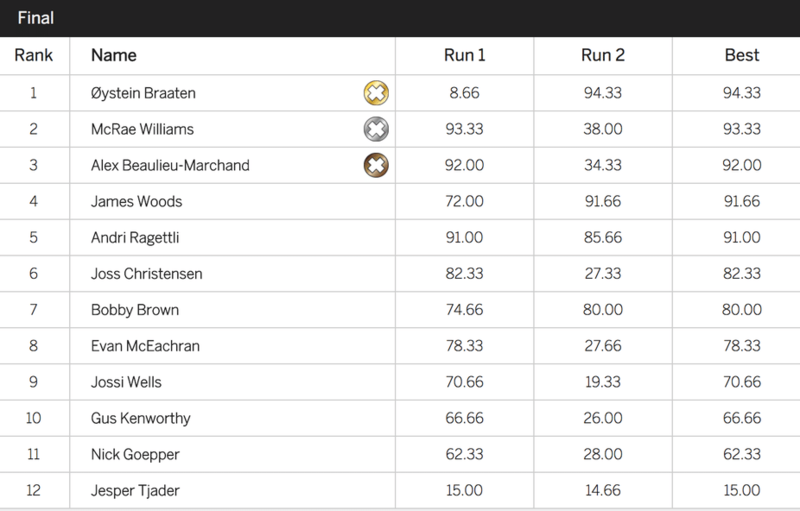 After the generally disappointing pipe event yesterday, X Games needed a lift and Mens Slope 100% provided it. You might have noticed I'm not a massive comp fan but the level of skiing today was pretty insane to watch. The judges obvious decision to score rails highly actually meant we saw some technical rail tricks and the jumps were, as ever, obnoxious but unbelievable. Frequent shouting at the TV took place in the NS SIA room. Andri Ragettli stomped the piss out of a straight up ridiculous first run to set the early bar at 91. Front swap transfer pretz four on the first rail feature backed up by a switch dub misty twelve to triple 14 mute at the bottom. Bobby Brown had some slight imperfections for a 74.0, Geopper missed a grab on his Triple. Joss C had a dope run with a lip 2 pretz 2 on the long flat rail for an 82.33 and provisional second. Evan McEachran had what I thought was a pretty crazy run but I guess the judges saw some little issues because he only got 78.33. McRae Williams absolutely slayed with a blind swap transfer, a switch 450 disaster and a switch triple 14 to go first with 93.33. ABM brought some alternative tricks to the party with a grabbed backslide up top, switch dub bio 12 to forward bio 12 for 92.0. Woodsy had some dodgy landings and only got a 72, but without question if he stomps that run, it's the best run in the contest: switch 2 pretz 2 on the wallride, blunt to truck dub 12 at the bottom. Oystein was lucky to escape from his first run nutsack intact after catching a tip on a switchup transfer. Gus Kenworthy had a dope rail section including a blind 3swap transfer but mirrored dub 10s at the bottom but put a hand down on the last hit, and Jossi had a sweet run but had again some wobbles. End of run 1, McRae's score was looking hard to beat. Andri Ragettli put down his same run again, but even bigger and adding a blunt to his switch dub misty 12 but going too big seems to have hurt him and he doesn't improve. 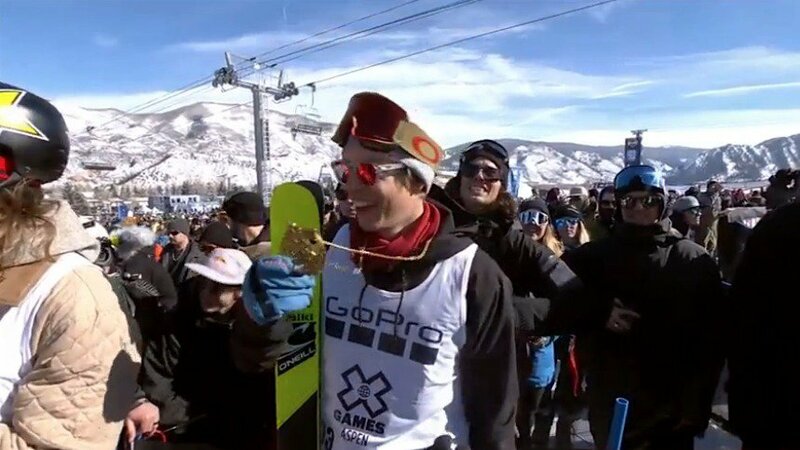 Nick Goepper almost back to back to back tripled at the bottom of a pretty solid rail run but went down. Both Joss and Evan McEachran had crazy top sections but crashed on triples on the last jump. Definitely less runs stomped this run because most people have now landed safety runs and are gunning for McRae's 93.0. Woodsy had the most ridiculous jump section of the day and the longest wait for a score. He had a bobble on one of his rails but it was good enough for third. Oystein's down rail to down rail transfer followed by switch dub 12 blunt and a triple 14, ridiculous. Gus went down super hard on his switch triple attempt. Final run of the day, Jossi Wells had a dope rail section but went down, crowning Oystein X Games gold medalist.